The scene: a room in the Cologne, Germany’s Hotel Coellner Hof. I sit reading the brochure that accompanies my Cologne Welcome Card, the passport card that affords visitors free rides on transportation and discounts at various attractions and museums. And, museums there are plenty. Historical, classical art, modern art, social, sports, chocolate . . .
There’s a chocolate museum in Cologne? Cologne, Germany, present many reasons to visit. Its centerpiece, like many European cities, is its cathedral. But, if you’ve got kids in tow, it’s not improbable to build your visit around a museum about chocolate. As it happened, our first Cologne day was a Sunday. A beautiful Sunday with bright sunshine and warm temperatures that brought out the crowds, locals and visitors alike. It was the kind of day that demanded a stroll or bike ride along the Rhine’s riverside promenade. It was the kind of day that demanded an early start just because the weather was so welcoming. The hotel actually is within 10-15 minutes’ walk (depending on how quickly you stroll) of the cathedral at the old town center. But, it’s three minutes’ walk to the combined train/subway station at Hansaring. With trains arriving and departing for the main railway station every few minutes, why not ride the rails for two stops rather than overtax weary feet? Indeed, again with kids in tow, we’d opt for a rail journey of any kind, just for the novelty of sampling different kinds of transportation. And kids will love Cologne’s main train station. More than 1,000 trains pass through it daily. Some, looking suitably dowdy and austere, only head to the suburbs. Others, looking modern if not downright futuristic, depart for exotic destinations like Paris, Rome, Berlin. There’s still something exotic being able to board trains that are bound for all points of the Continent. Cologne Cathedral sits adjacent to the main rail station. Early on a Sunday morning it proved a calm, almost empty place. An early service was in progress, but we few tourists wandered around gawking at the Gothic architecture. I stood rapt for several minutes studying a wild and colorful ceiling fresco tucked into a small cove-like area. Outside, the few milling around stretched necks and backpedaled fruitlessly, trying to photograph the entire edifice. These are Europe’s tallest Gothic towers. Can’t be done. Cologne Cathedral during a Sunday mid-afternoon presents an entirely different scene. The surrounding plaza buzzes like an anthill. Street artists decorate the pavement. Street performers juggle, mime and turn acrobatics. Hawkers sell. In-line skaters negotiate courses defined by mini traffic cones. Little kids ride trainer bikes or run joyously in circles. We wandered to the Museum Ludwig. Modern art tends to spark the youthful imagination. But, oh, what a wonderful building. Expansive, yet warm and welcoming, here’s a huge Picasso adorning a wide entry to a photography wing; there’s a tiny, odd-shaped window through which a cathedral tower can be glimpsed, artfully juxtaposing old and new; and, downstairs, an exhibit of mostly American modernists, including all the big names—Warhol, deKoonig, whomever. At the entrance, we present our Welcome Cards. No need, we’re told. It’s Museum Day in Cologne. All museum entry is free. But—we have our Welcome Cards . . . oh well. By the time we emerge from the Ludwig Museum, it’s late morning. The crowds are building. We stroll the riverside promenade, dodging bicyclists, skaters and hand-holding couples, while idly watching the famous Rhine River barges make their way up- and downstream. But, we’re not idling. Our destination is the Chocolate Museum. The museum is packed. Wall-to-wall folks. Why not? Entry is free today, and it’s a beautiful day to boot. Set on a small river island, the modernist glass and steel structure shaped like a ship contrasts sharply to the adjacent, classically styled Old Customs House. Inside, exhibits cover the gamut of chocolate: from farming to production to history to antique advertisements. But, face it—people are here to see the miniature chocolate factory in action. Only a few folks were perusing the history and farming exhibits. The production area was packed. And why not? People love to see how things are made. Here were huge stainless steel vats, pristine conveyor belts, shiny grated platforms on which to climb to peek into the processing machinery and, at the very end, a pair of chefs handing out samples—wafer cookies with a fresh chocolate coating. 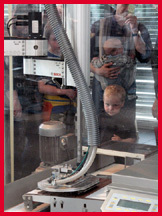 Kids stared with their noses pressed against the protective glass as small, round candies made their way down the line. Adults looked on no less transfixed. Better still, however, was lunch on the outdoor deck, overlooking the river and featuring an alarming range of chocolate choices. How we settled on the chocolate tort we chose, I have no idea. Oh, and we ate sandwiches, as well—just in case you think it was all-desert-all-the-time. Cologne is a somewhat gritty city, "Not so much like Munich or Frankfurt, which are cleaner and a bit more orderly," said our German companion Sibylle. "Cologne is more wide open, more radical." Indeed, in many ways the city seemed rather American, with its fair share of panhandlers and litter. Add an innate energy, plus a multi-cultural population, and a dynamic liveliness emerges. The outdoor cafes overflowed with patrons. The ice cream stands were busy. Bicyclists were abundant—whole families pedaling along the river. In fact, one wonderful touring option is to take a guided tour by bike. Come Monday, when all museums were closed, we took advantage of another sunny day with a trip to an outdoor sculpture garden and the zoo. 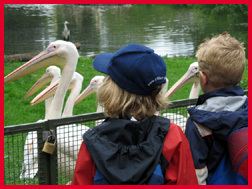 A zoo always works as a kid-entertaining destination, and here one of the challenges was to identify animals by in English when the signs were entirely in German. Not hard for an elephant, say, or a lion. But, some of the more esoteric species had us stumped. But, the shopping didn’t stump us. The city center offers a grand pedestrian mall with any and all types of stores. On a Sunday—deserted. On a Monday afternoon? Fugettabouit. Cologne was nearly 90 percent destroyed during World War II. Today, it’s a vibrant, bustling city of one million that makes a fine stopover and jumping off point for other explorations—like the Rhine or France’s Alsace Region. Guided City Tour on Bikes. 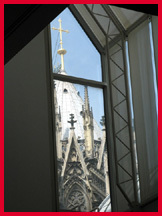 Three-hour bike sightseeing tours through Cologne depart daily at 1:30 p.m.
Cologne Hop-on Hop-off Bus Tour. Board and eixt the bus whe nand where you want as you tour the city. Sea Life Underwater World. A look underwater starting with the Rhine and continuing to the North Sea and the Atlantic Ocen. Museum for Applied Arts. There’s everything here from furniture, ceramics and glass to jewelry and modern designer stuff. German Sports & Olympics Museum. See all things Olympic in permanent and changing exhibitions—and engage in various kinds of action yourself. Cologne Carnival Museum. Carnival is an annual city-wide bash. But, if you’re not here at the right time, this museum shows you the history and pageantry of Carnival from ancient times and the Middle Ages to today. 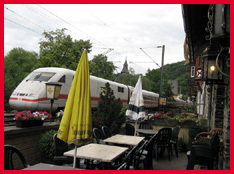 Rhine River Tours. Float leisurely down the Rhine to see superb scenery and castles, castles, castles. Queen Musical. Plying til March 31, 2008,the Queen musical "We Will Rock You" at Cologne’s Musical Dome highlights the legendary band with 25 of their hits and a serious sound and light show. ......Mitch Kaplan is the author of The Unofficial Guide to the Mid-Atlantic with Kids, The Cheapskate’s Guide to Myrtle Beach and The Golf Book of Lists. He is a contributor to The Unofficial Guide to New England & New York with Kids and to the annual guide Ski America & Canada.